ABOUT THE GAME	Get in touch with your inner dictator!Command the Caribbean nation of Tropico in this delicious combination of strategic city builder and humorous political simulator. As an all-powerful Presidente with a resource-rich paradise in the palm of your hand, it’s your choice to rule with a velvet glove or an iron fist. 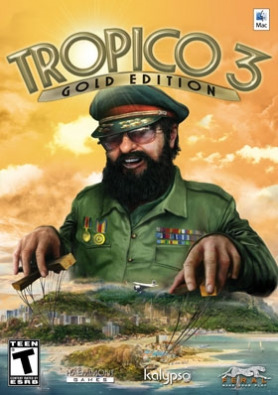 Tropico 3: Gold Edition gives you control over everything fr… om your island’s infrastructure to its economy and diplomatic relations with competing superpowers. Balance the noisy demands of Tropico’s hard-to-please political factions with those of your offshore bankers in this tongue-in-cheek recreation of the Cold War in a hot climate. KEY FEATURES	Have it your way! Run Tropico as a tourist mecca, an economic miracle, a police state or all three! Enjoy both the epic challenge of the 15-mission Campaign Mode and the intoxicating freedom of Sandbox Mode. When you’re the corrupt dictator of strategically important island, stuff happens! Wield your influence over every aspect of island life to prepare for everything from natural disasters to nuclear war. Help the people see things your way by recounting elections, “calming” rebels and issuing “creative” edicts, such as Burn Books, Bribe Factions and Print Money. Play as your favourite dictator! Pick from a rich list including Che Guevara, Evita Peron and of course, Fidel. Or create your very own strongman by shaping their character, background and beliefs. Create a cult of personality around El Presidente, help compose his silver-tongued speeches, manipulate the media and build monuments in his honor. Enjoy Absolute Power, the expansion pack included in Tropico 3: Gold Edition which offers a completely new 10-mission campaign. And always remember - power corrupts, but absolute power totally rocks. SYSTEM REQUIREMENTS Minimum	OS: Mac OS X 10.6.8 Processor: 2.0Ghz RAM: 2.0GB Free Space: 7.0GB Graphics: 256MB Accessories: Keyboard RecommendedOS: Mac OS X 10.7.0 Processor: 3.0Ghz RAM: 4.0GB Free Space: 7.0GB Graphics: 512MB Accessories: Multi-Button Mouse Notes	Requires an Intel processor. The following graphics cards are not supported: ATI X1xxx series, NVIDIA 9400, NVIDIA 7xxx series and Intel GMA series. The following cards require you to have 4GB of System RAM: NVIDIA 320M, Intel HD 3000. Copyright © 2009-2011 Kalypso Media GmbH. All rights reserved. Published by Kalypso Media GmbH. Tropico is a registered trade mark of Take-Two Interactive Software, Inc. used under license by Kalypso Media GmbH. Mac and the Mac logo are trademarks of Apple Inc. registered in the U.S. and/or other countries. Feral and the Feral logo are trademarks of Feral Interactive Ltd. All other logos, copyrights and trademarks are property of their respective owners. All rights reserved.